What a great weekend! Not only was the weather amazing, but Chris and I got so much done in the backyard, just need to plant some herbs and stuff and we’re done! We also finished staining the patio table Chris built, he’ll be posting that soon so check back this week. After a long day of working in the backyard, there’s nothing better then finishing the day with a tasty mojito. Chris and I got hooked on this drink after our first trip to Cuba. I try to have the ingredients on hand at all times, but luckily if we ever need more limes or soda water our neighbours (who also love mojitos) usually have what we are missing. 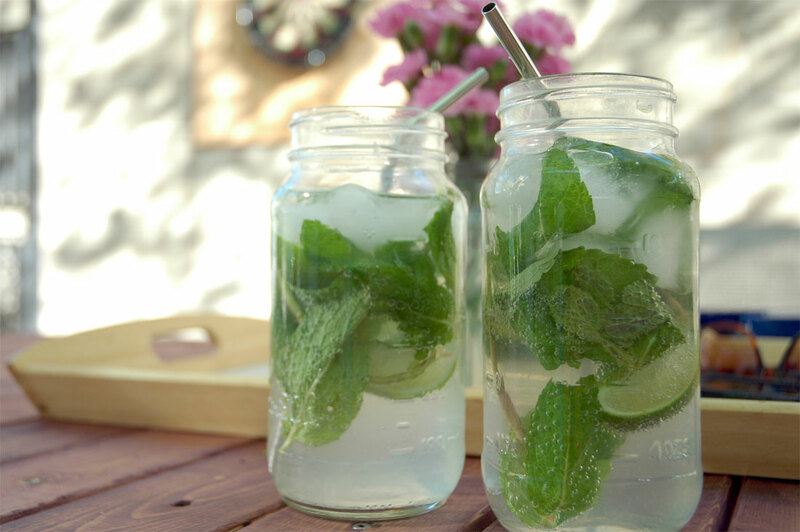 Other than being deliciously refreshing, mojitos are so easy to make. Check out the recipe (if you can call it a recipe, haha) below. Cheers! Cut lime into wedges, I usually use a half lime per drink. Toss in the limes and mint and muddle. Next add the rum, then ice and then top with soda water; stir it up, pop in a straw and enjoy!